You know it’s happened to you. You’re sitting in class, with a few minutes to go before dismissal, and you start getting antsy. You’re shaking your foot a bit, playing with your hair or your pencil, when suddenly, “crack!”. You start cracking knuckles. Of course, time and time again, you have been warned against this action. At least for me, I am constantly told never to crack my knuckles because cracking your knuckles causes arthritis. However, this is a common myth that is constantly debated. I decided to try and get to the bottom of it. So, through some research and investigating, my goal is to find out once and for all whether there is any truth to this myth. The first step in this process is to define arthritis, and how it is commonly caused. According to the Arthritis Foundation, arthritis is defined as not one disease, but a common way to diagnose overall joint pain or disease. In fact, there are, as the Arthritis Foundation points out, over 100 different types of arthritis that are commonly seen across all different people. Arthritis affects over 300,000 children and 50 million adults, most notably women, and is more common in older people as the leading cause of disability in the United States (arthritis.org). The symptoms of arthritis are many and varied in severity. Most commonly, arthritic people suffer from pain, swelling, stiffness, and a decreased range of motion; a few of the most severe cases include chronic pain and a loss of capability to walk or do average activities (arthritis.org). According to the Arthritis Foundation, arthritis is most often invisible except to a viewer of an x-ray, as the damage can also affect the eyes, kidneys, heart, skin, and lungs in addition to one’s joints. So, where does cracking knuckles come into play? What Happens When a Knuckle Cracks? According to one Harvard Health Publication, the cracking sound of a knuckle is the result of bubbles bursting in synovial fluid, the substance that is responsible for lubricating the area between bones in order to ease movement and joints. As Sean Hutchinson, contributing writer to Mentalfloss.com, describes, stretching or bending your fingers backwards expands the joint, causing a decreased pressure between the joints and ligaments that connect two bones. As pressure drops, gasses such as oxygen, CO2 and nitrogen are dissolved in the synovial fluid to create the small airbubbles that fill this area (Hutchinson). However, once the joints return to normal, the fluid replaces itself and pops the bubbles that temporarily replaced it, created the popping sound that comes with a cracked knuckle (Hutchinson). So, does this action cause arthritis? We have to turn to studies to find out. As I continued my research, I found one particular article that indicated a few key studies in this field that researched this question. In an article by writer Steve Mirsky for the Scientific American, he discussed one particular study by one scientist and author, Donald Unger. Unger won the Ig Prize for his work with this question. According to Mirsky, for 50 years, Unger cracked only the knuckles of his left hand for a minimum of two times a time, therefore keeping his right hand as the control, his left as the experimental. This totaled to a minimum of 36,500 knuckle cracks of his left hand over the course of five decades, with an occasional rare cracking of his right knuckle (Mirsky). 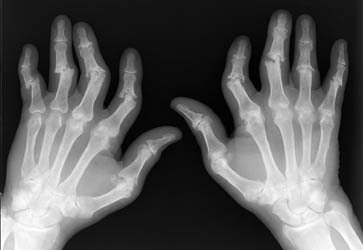 After this 50 year period, Unger decided to check his results, and he found that there were no clear differences between his left and right hand, and he had not developed arthritis in either hand (Mirsky). Therefore, as Mirsky stated, he concluded that there was no clear relationship between the cracking of knuckles and the development of arthritis. However, one flaw in this study is that it was not blind, as he knew his left from his right and consciously decided his left would be the consistently cracke hand. One additional study was conducted by David Kingsley, a Stanford University bone development expert, who decided to travel to an nursing home and ask each person their history of knuckle cracking, and then assess whether or not they had developed arthritis (Mirsky). As Mirsky summarized, after traveling to 28 nursing home and examining over 300 people, Kingsley also found no link between knuckle cracking and arthritis. 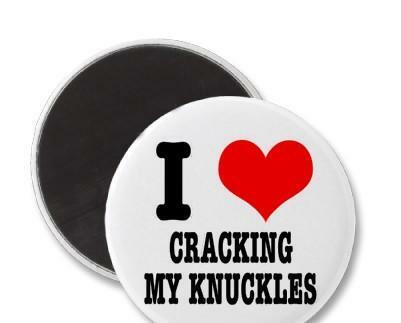 In conclusion, knuckle-cracking may not be the cause of arthritis, as no studies have yet found a link between the two. However, it is definitely annoying, and can even lead to swollen hands and struggling grip strength, as the Harvard publication indicated. Although there is no link, I am still going to try my best to avoid it. This is a very well written article that is very relatable due to the frequency at which some people, including myself crack their knuckles. I do it often impulsively without any thought of possible long term effects. While it is refreshing to know that it doesn’t cause arthritis it is definitely something I should stop doing as frequently as I do. Here is a youtube video that thoroughly explains what exactly happens when you crack your knuckles. This is very interesting because i have always been told not to crack my knuckles or they will get fat. It was very interesting to learn the truth behind whether or not it actually has an effect on me. Now I will probably stop cracking them, just to be safe. Thanks for sharing. Very relatable topic for me since I have been told since I was little to not crack my knuckles. I honestly thought cracking knuckles was just weirdly adjusting the bones and not about popping bubbles in synovial liquid (sounds pretty gross honestly). I’m so bummed that while it doesn’t cause arthritis it can still be annoying and affect your hands, as I was hoping that I could tell my parents I was right and they were wrong. However, really interesting topic and it looks like I should make a few lifestyle changes. When I was a kid I used to get so many different reasons for why cracking your knuckles were bad until this cab driver in Colorado told me that he got arthritis from cracking his knuckles over a life time and that’s when I just stopped. But once I got to high school I talked to friend’s that told me all it is was as you mentioned synovial fluid creating air bubbles between the joints. I don’t know who to believe anymore! This post caught my attention because my mom yells this at me every single time she hears my knuckles crack. I always wondered if there was much truth to it. It was interesting to find out what is actually happening to my hands when I crack my knuckles. I am also grateful to find out that I probably will not get arthritis from cracking my knuckles, but I do agree that it is not a habit that I should keep up.